Please note that the content of this book primarily consists of articles available from Wikipedia or other free sources online. Bitter Creek is an 80 mile long stream in the U.S. state of Wyoming. It passes through several Wyoming counties including Sweetwater, and Carbon. The creek rises near the Delaney Rim on the western side of Wyoming's Red Desert in Carbon County. 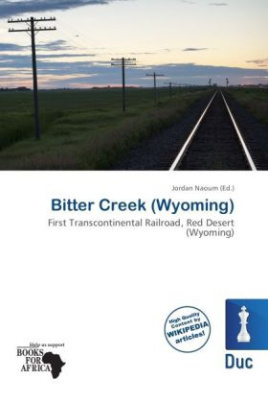 For most of its course, Bitter Creek parallels the path of the transcontinental railroad, and the modern route of Interstate 80. It flows through the cities of Rock Springs and Green River before emptying into the Green River. In the coal mining heyday for Rock Springs in the late 19th century, the creek formed a boundary between a Union Pacific coal mining camp on the south, and an encampment of Chinese immigrant workers on the north.